ACP is a highly diversified company which enables us to offer comprehensive customized services from initial concept development to final production and follow up with expert repair services. In order to streamline processes, ACP is divided into three separate working groups. Initial concept development and prototyping is completed in the prototype facility which develops projects from customer specifications. The prototype facility is also set up to handle small production runs for high performance parts or parts requiring special inspection and procedures. Once a part has been approved and an order is initiated, the order is turned over to the production shop for tooling and, finally, manufacture and assembly. Research & Development: Our highly skilled R & D team will work with you throughout the entire run of your project, bringing your vision to reality. 1.Pattern Making : Patterns are created to the exact specifications of your drawings and are presented to you for approval before the mold making process. 2.Mold Making : Molds are created to be shipped to you for your manufacture or we can handle the manufacture & assembly at our location for you. Manufacture & Assembly : Your project is made to order by our staff of technicians who among them have decades of experience in the intricate and sometimes complicated art of composite fiber manufacturing. 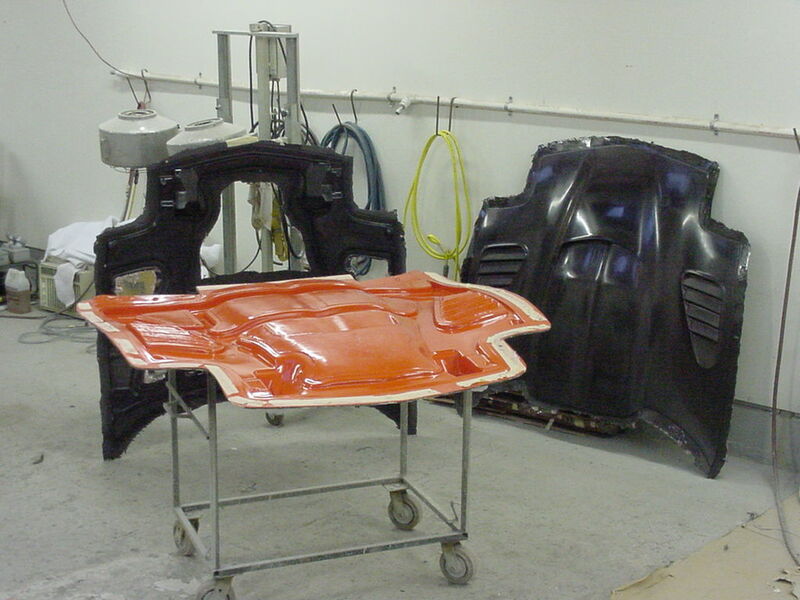 A mold (in orange) in front of 2 'fresh-out-of-the-mold' parts. These examples are from the new ACP Louvered Air Extractor Hood developed for use on C-5 Corvettes.